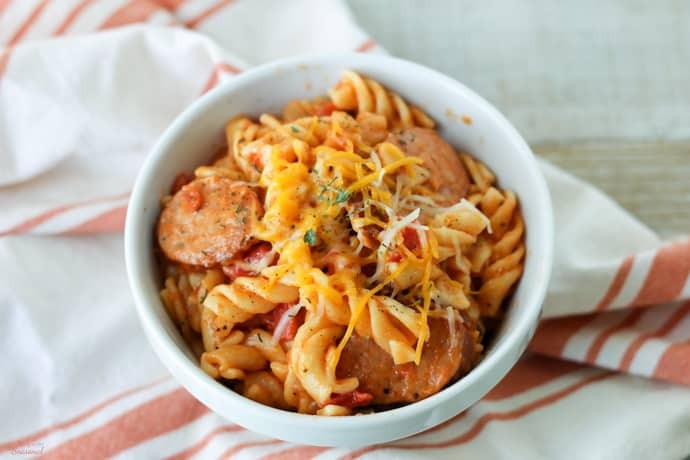 One of our family’s favorite recipes, One Pot Pasta is both easy and delicious. 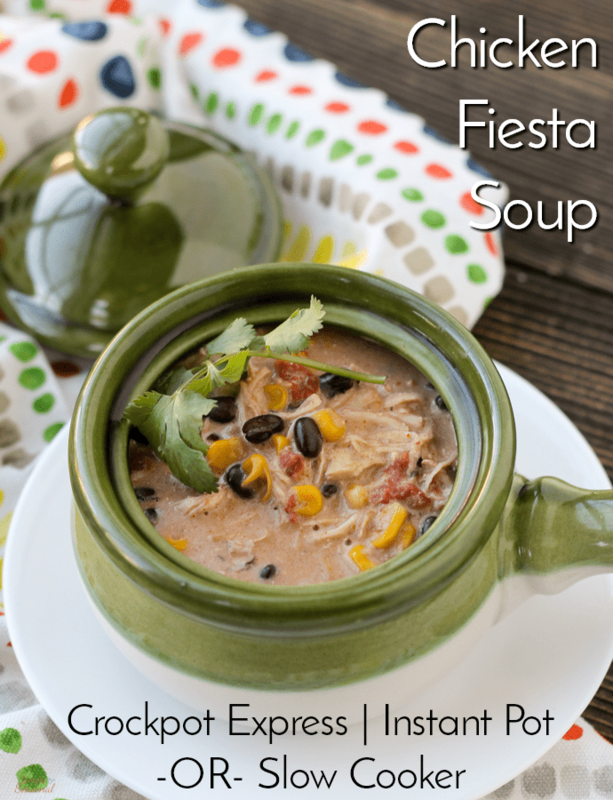 Make it either on the stove top or in the pressure cooker for a meal ready in less than 30 minutes! ONE POT. Do you know what that means? You can cook an entire meal in ONE pan. Even the pasta-it cooks in the sauce with everything else! This came together in under 30 minutes and was wolfed down by my husband and boys. I was so happy with how this came together! Oh-and it’s cheap. Check. Check. Check. 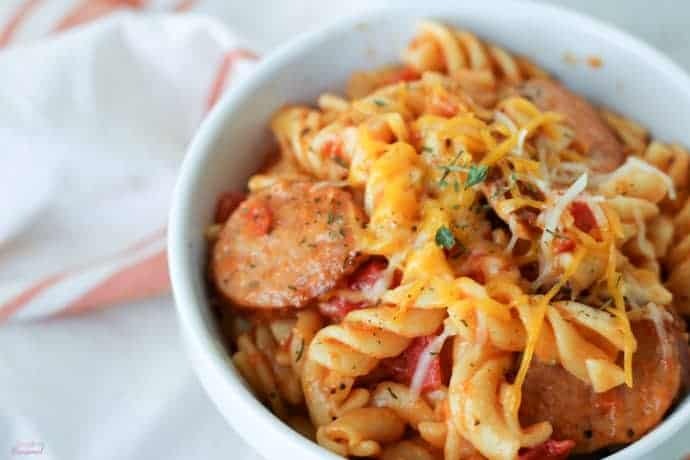 Added to the menu rotation: One Pot Pasta. I originally posted this back in 2014, and now I’ve updated it with instructions for the Crockpot Express (or Instant Pot) as well. I knew a meal that was already quick and easy on the stove top would translate well to a pressure cooker. It took a couple tries to figure out how to convert the recipe, but I’ve got it down now. The prep and cook time is probably very close to doing it in a skillet, but being able to just throw it in the pot and walk away is so handy! In a large skillet with lid (oven safe) heat olive oil on medium-high heat, add onion, cooking until lightly browned. Add sausage and cook approximately 5 minutes. Add garlic and cook additional 1-2 minutes, stirring. Add broth, tomatoes, cream, pasta and spices and stir. Bring to a boil, cover skillet and reduce heat to simmer for approximately 15 minutes. Remove skillet from heat and stir in 1/2 cup of shredded cheese. Top with remaining cheese & green onion, broil slightly until cheese is melted and you have a nice little "crust". If you do not have an oven-safe skillet, transfer to a casserole dish sprayed with non-stick spray and then broil, or toss the cover back on more a few minutes to melt the cheese. Using the Brown/Saute function on high, heat olive oil, add onion, cooking until lightly browned. Add sausage and cook approximately 5 minutes. Add garlic and cook additional 1-2 minutes, stirring. Add the rest of the ingredients except the cheese, cover and press Steam (manual, high pressure for Instant Pots) and adjust the time to 5 minutes. After the cooking time is up, allow to naturally release for 3 minutes and then do a quick release to finish it up. Open the lid, sprinkle with cheese and recover for a minute or so to melt the cheese. Stir well and serve with crusty bread! Barely adapted from Who Needs a Cape? Guess what? It’s just as good the next day for lunch. It’s hard to mess this recipe up. You can adjust it to suit your tastes and you’ll still get a very hearty and comforting meal. Serve it with salad and a loaf of crusty bread for a fantastic family meal. 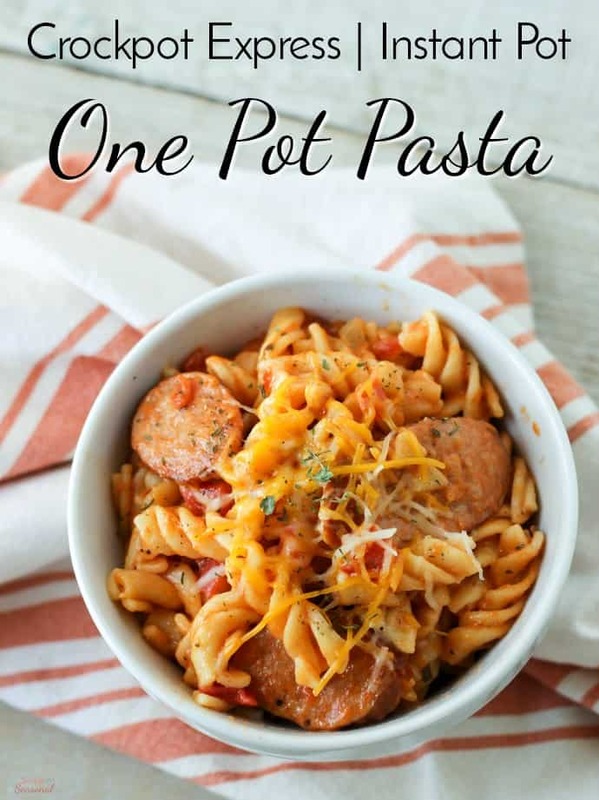 This is another one of our favorite “one pot” recipes! HOW do I get rid of that after-wash white powdery residue on the bottom of my pan? It doesnt seem to scrub out and I dont know what it is really…can you help? Are you washing in the dishwasher? Some detergents react and leave a powder behind. It’s best to just hand wash it. It wipes right out. I’m not sure what else could be leaving a residue. Oh WOW! This looks amazing…I will be trying this tonight! This looks awesome. I love one-skillet meals! I just want to dive right into this! Bowties are one of our favourite pastas, LOL. Thanks for sharing at Simple Supper Tuesday. I love them, too. They are fun 🙂 This recipe was a couple weeks old, but it fit in the theme of your link party, so I figured it would pass. Featuring at Family Fun Friday! Your pictures are making my mouth water. This looks awesome! I’ve Pinned this to my board! Gotta try it soon. Great recipe! It’s quick and easy, doesn’t dirty up a lot of dishes and it’s perfect for during the week when I’m usually super busy! Pinned and shared on FB & Twitter. 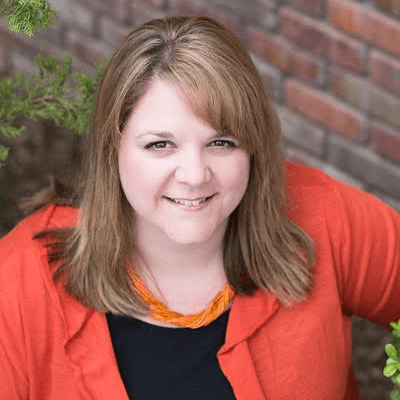 Thanks for sharing at Marvelous Mondays! Thanks! I already have it on this week’s menu again! 🙂 I’m going to have to check out your taco casserole now! Oh my… look at that cheesy goodness!! I am getting hungry just looking at that mouth watering photo! I think we might have to make this one day soon! Found you through the link party at This Gal Cooks. I am glad that I did! Thanks for stopping by! It’s going into our regular meal rotation for sure! 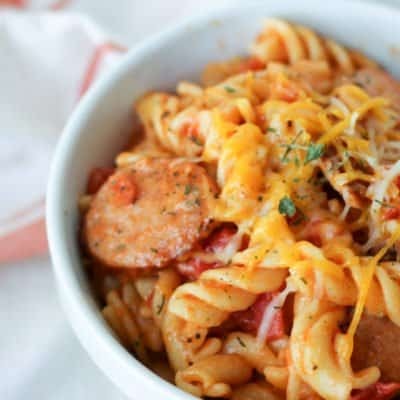 Man, this looks yummy, can’t beat some cheesy goodness, nor a one skillet mea!! Okay you’ve won me over! My lot would so go for this, pinned! Delight.